You can't blame hydraulic fracturing for every natural disaster, but newly published research has linked 400 small earthquakes in Ohio last year to the geology-busting technique. Let me emphasize that the earthquakes were small. So small, in fact, that every one is believed to have gone unfelt by anyone on Earth's surface. That being said, the earthquakes represent the first known instance of seismic activity in the area. They were also three orders of magnitude larger than expected, according to seismologist Paul Friberg, co-author of the study describing the activity in the latest issue of Seismological Research Letters. [Jackson] said the Friberg's work confirms that fracking can cause small earthquakes. 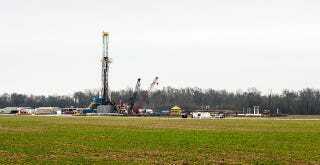 "The tremors revealed a previously unknown fault right below the natural gas well," he said. There have been three documented earthquakes able to be felt on the surface that were linked to fracking, Friberg said. That's because fracking fluid is thought to lubricate faults, possibly causing them to slip, he said. But many more earthquakes have been caused by waste water injection, as many as 188 nationwide in 2011, according to the Stanford study. "Pumping wastewater deep underground is a bigger risk of causing large earthquakes than fracking," Jackson said. "Earthquakes associated with waste water disposal have already damaged buildings and injured people in rare cases." Read the full scientific study in Seismological Research Letters. More analysis from Magill at Climate Central.